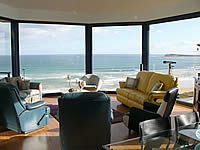 Ocean Grove’s best views, location and property. Park your car when you arrive and walk everywhere, or sit and enjoy the view all week. 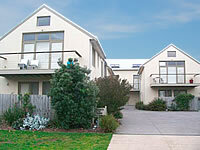 5 min walk to beach, shops, restaurants, pub, supermarket, and Ocean Grove shopping centre. Enjoy your holiday time in spacious luxury, fully equipped with designer finishes and everything you could possibly need for a real "spoil yourself" holiday of ultimate indulgence. Are part of the Villas on Dare - a complex of luxury villas. The Villas all feature 3 bedrooms and two large bathrooms one with corner spa. Large kitchen dining living areas are located on the first floor to ensure sea glimpses. The Villas have polished floors, and are fitted with s/steel appliances, TV, DVD, or videos, fully equipped laundries, AND a lock up garage at each Villa plus a car parking space, you can park the car when you arrive and walk everywhere. 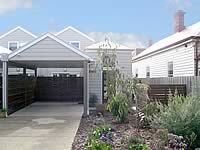 Is a luxury 2 bedroom villa in the main street of Barwon Heads. Currently, your choices are units no.6. These recently completed villas are in the perfect location for your holiday break. Take 400 steps and you have been to the supermarket, bakery, restaurant, newsagent, river, beach on a round trip and back home. This is what a holiday is about! Are luxury, contemporary two storey villas, fully self contained, in the heart of Barwon Heads, just off the main street, minutes walk to river, beach, restaurants, supermarket, cafes, specialty shops, and all Barwon Heads has to offer. Each Villa has 3 bedrooms one queen bedroom with its own garden courtyard and ensuite, including spa on the ground floor. 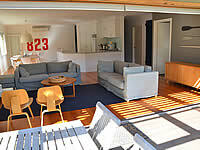 Another two bedrooms are situated upstairs, both queen doubles with their own full bathroom. Luxury Grove - you’ll be in the lap of luxury at this exceptional cliff-top, split-level, holiday home with stunning views of the Barwon River estuary and surrounds and located very close to the main ocean beach. Luxury Grove will provide you with the consummate holiday experience with its proximity and ease of access to the beach, shops, restaurants and the Barwon River estuary for boating, fishing and surfing. 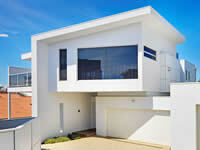 Is a stunning light filled and spacious 4-bedroom beach house located just off the main street in Barwon Heads. Just a few minutes walk from the main street restaurants, popular Annie’s Providore, the beach, rivers edge and kids playground. Contemporary Corse is the perfect place for a weekend stay, summer holiday or family celebration with enough rooms for the extended family.